Do you watch 3D movies in 2D? 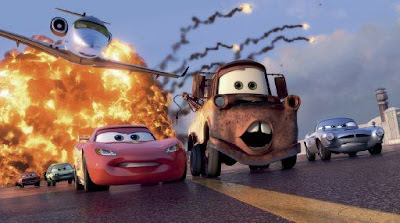 Saw “Cars 2” last night, and while it’s a little disappointing (it’s no “Up” or even “Cars”), it’s still a sweet, technologically impressive Pixar movie, which automatically makes it better than most movies out there. After watching it, though, I had the same question I had after viewing “Up” or “Toy Story 3” — why is this movie in 3D? The effects are subtle and pretty but, I’m guessing, would in no way be missed in 2D. (And, particularly if you’re bringing the kids, you’ll save a lot of money by choosing 2D.) Generally I see things in 3D at press screenings because that’s the option presented to us, but if I had a choice I think I’d go with 2D most of the time, except for the rare occasion when a movie is actually originally conceived and shot in 3D. And Pixar movies, definitely, don’t need an added gimmick; they were doing just fine before 3D came along. So: Given a choice, do you watch 3D movies in 2D? (Will you, for example, see “Cars 2” in 2D?) The Vulture blog at newyorkmag.com earlier this week asked the question and nearly everyone voted for 2D. What do you think?